NASA Earth Observatory image created by Robert Simmon, using Landsat data provided by the United States Geological Survey. Caption by Michael Carlowicz and Laura Rocchio. Forty years ago, after more than a decade working to leave our planet, NASA launched an unprecedented mission to look back at home. 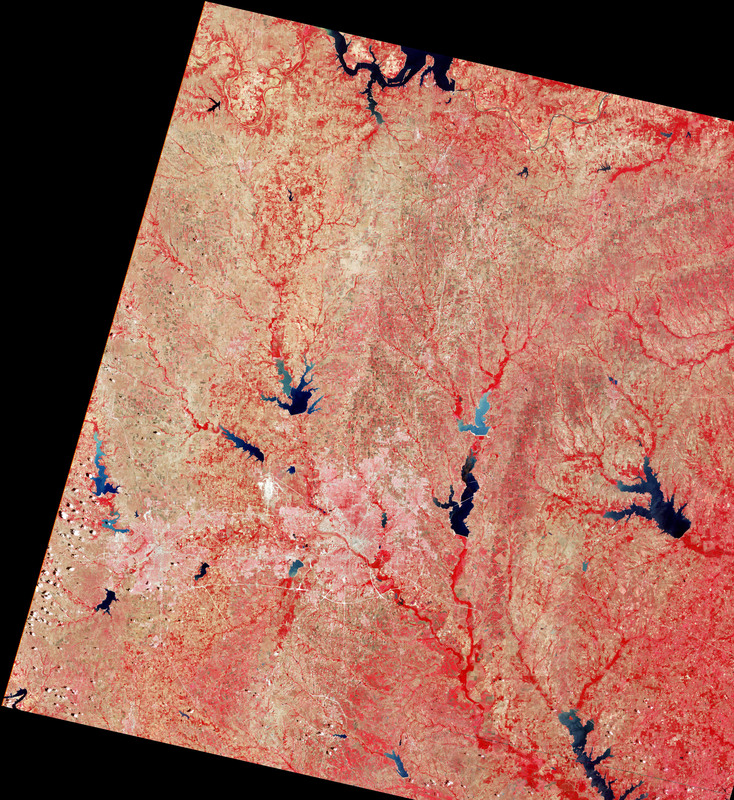 Four decades later, the Landsat program is still going strong, with more than three million images of Earth in its archives and a new mission slated for launch in 2013. On July 23, 1972, the Earth Resources Technology Satellite (later renamed Landsat 1) lifted off on a Thor-Delta (Delta 900) rocket from Vandenberg Air Force Base in California. The first images from the satellite’s Multispectral Scanner System (MSS) were received a day later by scientists gathered at NASA’s Goddard Space Flight Center in Maryland. 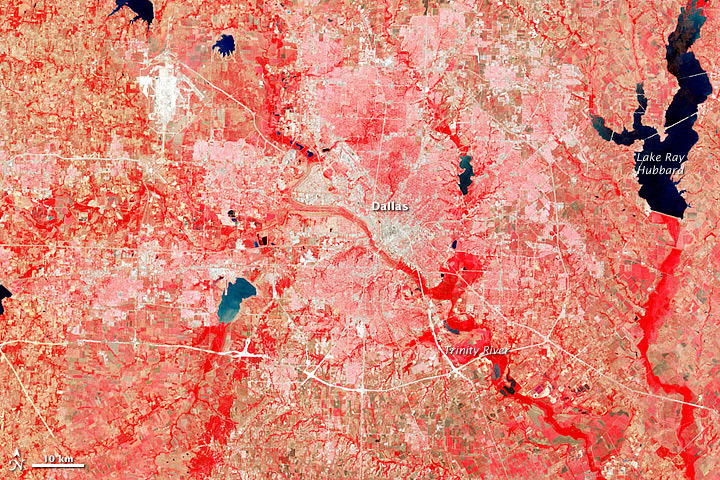 The very first image in the Landsat archive is the MSS image above, showing the greater Dallas area of Texas on July 25, 1972. The resolution is 60 meters per pixel in this false-color image, where shades of red indicate vegetated land and grays and whites are urban or rocky surfaces. Scientists involved in the mission weren't sure what to expect of the MSS, which used new fiber-optic technology, took pictures in four different bands of the spectrum, and scanned the Earth in strips. (More conventional television-style cameras—known as return beam vidicons (RBV)—had been expected to be the main workhorse of the satellite.) A group of scientists and technicians gathered at NASA Goddard with great anticipation, as the first MSS transmission was translated onto film by an electron beam recorder and then put into a viewing device. As the imagery scrolled into view, there were clouds...and then more clouds...and then land. But something looked strange. A technician in the room lamented: “lt’s terrible. It has moiré patterns.” But after figuring out the location of the image—the Ouachita Mountain region in southeastern Oklahoma—scientists realized that the imagery was showing circular outcrops of the ancient fold mountains. Read more about the history of the Landsat program in our new feature story: Landsat Looks and Sees.